Still on his slowing down lap, in the midst of tears of joy in the immediate aftermath of becoming only the third driver in history to win three consecutive Formula 1 titles, Sebastian Vettel had the presence of mind to correct team principal Christian Horner on his grasp of history. "Christian came on the radio," Vettel said, "and mentioned the names who had achieved similar, and he forgot [Alain] Prost so I told him. But we had no radio so he couldn't hear me." It is that sort of coolness even in moments of extreme emotions that has helped Vettel join Juan Manuel Fangio and Michael Schumacher in one of F1's most exclusive clubs. His achievements following his sixth place in a chaotic, thrilling, dramatic and constantly shifting Brazilian Grand Prix go much further than that. Vettel becomes the ninth man in history to win three titles - following Fangio, Sir Jack Brabham, Sir Jackie Stewart, Niki Lauda, Nelson Piquet, Alain Prost, Ayrton Senna and Schumacher. And he is the youngest in that list by a gob-smacking six years, replacing Senna, who Vettel described as "one of my greatest idols". That last fact in itself is perhaps the most remarkable of all the statistics Vettel has racked up so far - at a rate which, if it continues, threatens all F1's records. Vettel's success, of course, is not just down to him. His Red Bull team are building a dynasty of their own to match that of Schumacher's Ferrari team of the early years of last decade. Led by the genius of Adrian Newey - the sport's pre-eminent aerodynamic engineer - all of that expertise, and what is believed the biggest budget in the sport, is focused on Vettel's success. But that is the case because they know he can deliver. The 25-year-old German has driven a superb season. He has made relatively few mistakes, won races when he has had the best car and delivered solid points when he has not. And in Brazil he kept his cool under the most extreme of tests. Knocked into a spin on the first lap, he ended it last. In a damaged car, he fought brilliantly back up to sixth place by the end of lap eight, within sight of championship rival Fernando Alonso. Two laps later, he was in for 'intermediate' tyres in response to increasing rain. Nine laps after that, he was back in for 'slick' dry-weather tyres as it dried up. After a safety car period, he came in to fit fresh dry-weather tyres with 19 laps to go, only to have to come in again two laps later for 'inters' when the rain started again. After all that, he was seventh - still good enough to win the title even with Alonso in second place - and seventh became sixth, to ease his tortured mind a little, when his friend Michael Schumacher let him by with seven laps to go. It was one of Vettel's best drives even if it will not exactly do a lot to quieten those, such as Lewis Hamilton, who believe that luck seems always to be on his side. After the race, although clearly overwhelmed with emotion after the extremes of the day and at what he had achieved, Vettel was as keen to talk about what he called the "dirty tricks" of Red Bull's opponents as he was his success. He added that "people tried everything - inside the lines, outside the lines - to beat us". Invited to expand on his accusation, he declined. As did Horner. Vettel may have been referring to the series of technical controversies in the first half of the season, when Red Bull's rivals accused them of breaking the rules. Three times in the first half of the season, Red Bull were asked to make changes to the RB8 by governing body the FIA to ensure it complied with the regulations. And another time the rules were tweaked to ensure something Red Bull were doing was stopped. Or perhaps he was talking about Ferrari's complaints that Vettel should have got a grid penalty for blocking Alonso in qualifying in Japan in October. And he was almost certainly referring to Ferrari's decision to trigger a gearbox penalty for Felipe Massa to move Alonso up a spot and on to the clean side of the grid in Austin. Whatever, it was perhaps a surprising thing to come out with in the immediate aftermath of the greatest achievement of his short career. Which some will undoubtedly see as a reflection of how strong Vettel's feelings are about it. Asked what he thought Vettel might be referring to, Ferrari team boss Stefano Domenicali said he did not want to be drawn into it. Domenicali preferred to talk about Alonso's bad luck in losing the championship by just three points after what the Spaniard referred to quite rightly as "by far the best season of my career". Good as Vettel's season has been, most in F1 would argue that Alonso's was even better - a sense that became increasingly apparent as the weekend went on. Jenson Button, a superb winner of a race in the sort of mixed conditions in which he so often excels, talked beforehand about how he would prefer Alonso to win the championship because he had been "more consistent". Immediately before the race, Button's team boss Martin Whitmarsh said he was "humbled" by what Alonso had achieved in a relatively uncompetitive car. That from a man who at the 2007 Hungarian Grand Prix had wanted Alonso thrown out of McLaren on the spot for his threats to the team in a row with then boss Ron Dennis. Domenicali and Alonso both referred to his bad luck in his first-lap retirements in Belgium and Japan. Some believe Alonso was partly to blame for his rear wheel being tagged by Lotus's Kimi Raikkonen at the start in Japan. In any case, it's irrelevant because he was certainly blameless for the Finn's team-mate Romain Grosjean landing on his Ferrari in Belgium. A podium finish there, which he would almost certainly have scored, would have comfortably resulted in Alonso leaving Brazil as champion rather than a "proud" but disappointed runner-up. Alonso has every reason to be pleased with himself after achieving what he did in a car that started the season 1.5 seconds off the pace and was never fast enough to set pole position in the dry. Yet here was a hint of bitterness, too, in his post-race comments about "some strange decisions, let's say, in terms of penalties" - undoubtedly a reference to Japan, and possibly the technical controversies, too. This rivalry between Vettel and Alonso is developing into one with real teeth and real depth. 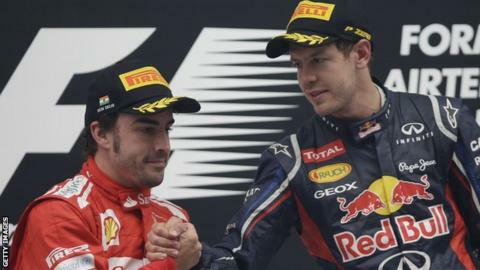 That's two titles in three years Alonso has lost to Vettel through bad luck and it's not hard to imagine them being the main contenders again next year. Lewis Hamilton is the other member of F1's big three, and but for bad luck and poor McLaren reliability he may well have been champion in 2012. But it's surely expecting too much for Mercedes, to whom he is moving next year, to close the yawning performance chasm to the top teams, even with Hamilton in the car. There are also question marks over McLaren's ability to mount a consistent challenge without Hamilton, unless Button can ensure he does not fall prey to the tyre-management problems that hampered him this year. Realistically, then, that leaves Vettel and Alonso again. But if they can stage a fight as titanic as they did this year, it is something to look forward to. And if Ferrari can deliver on their pledge to ensure they start the season with a more competitive car than they did this year, it will be even harder for Vettel and Red Bull to continue their remarkable run of success.